We start off Omega's CotD week with some interesting new cards. Basically, you have Jinzo and Spell Canceller in the same card, each different thing requiring a support card. I'm sorry for the short review, but I'm dedicating time to the other CotDs -- if you're going to play the negation game, don't play two half-assed parts of it -- play very few or no traps and run Jinzo, or run a lot of Traps and run Spell Canceller. Stay away from this card. With 1100 ATK and 900 DEF, he's searchable via Witch, Sangan, and Tomato; but the whole "no effect" thing kind of drags him down. Essentially, he's utter crap on his own, although his flavor text rhymes, which is a plus, I guess. 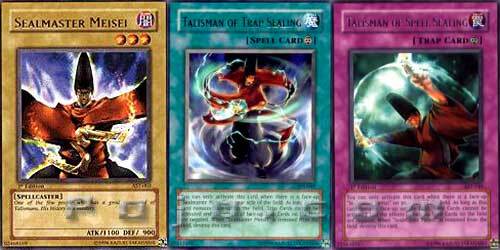 Now let's look at the Talismans: ToTS is actually a fairly good card. It's a Continuous Magic Card that basically acts as a Jinzo. This could definitely be useful to have when you’re on the offensive; all you need is Meisei on the field to activate it. Of course, if ALL you have on the field is Meisei, you won't necessarily be worried about Traps; you'll be worrying about...everything. So this requires some more cards to work effectively. Then we have the other one, Talisman of Spell Sealing. Think Imperial Order, but instead of paying 700 LP each turn, you just need to have a really crappy monster on the field. Again, it could be useful; but Meisei is still vulnerable to A LOT, namely monsters. Stopping your opponent's Raigeki won't help you if he just slams into Meisei with an Archfiend Soldier. Really, the concept of these cards is good; but Meisei alone + either one just isn't worth it. They're best used to supplement other monsters you already have on the field, and the fact that you need two cards (Meisei and a Talisman) just to help out your current force really drags down the playability. You could, however, build a deck around these cards; just make sure you have other cards (strong monsters, for example) to make these worthwhile.